I’m a little bit snowed in today. The snowplow left a nice big pile for me at the top of our steep driveway, so while I contemplate looking for the snow shovel (..I saw it last year) and trudging my way up the hill to dig out, I figured I’d bake something instead. Well, isn’t that what you’d do? 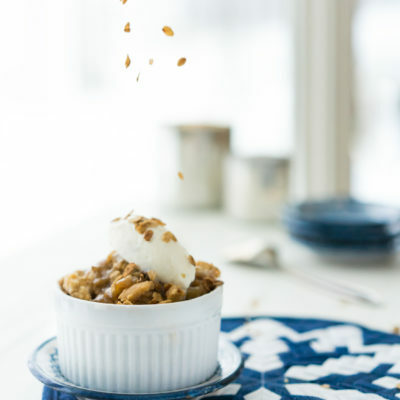 These mini apple-maple crisps are decadently delicious, and when topped with Vermont granola, vanilla ice cream and quick, easy-to-make salted maple caramel sauce, it’s an over the top dessert that’s perfect for your holiday dinner, or as something to indulge in on a snowy day while you’re thinking about doing some strenuous snowshoeing. Plus, it can be made ahead and reheated just before serving which makes it a doubly good option for feeding a group at holiday time. 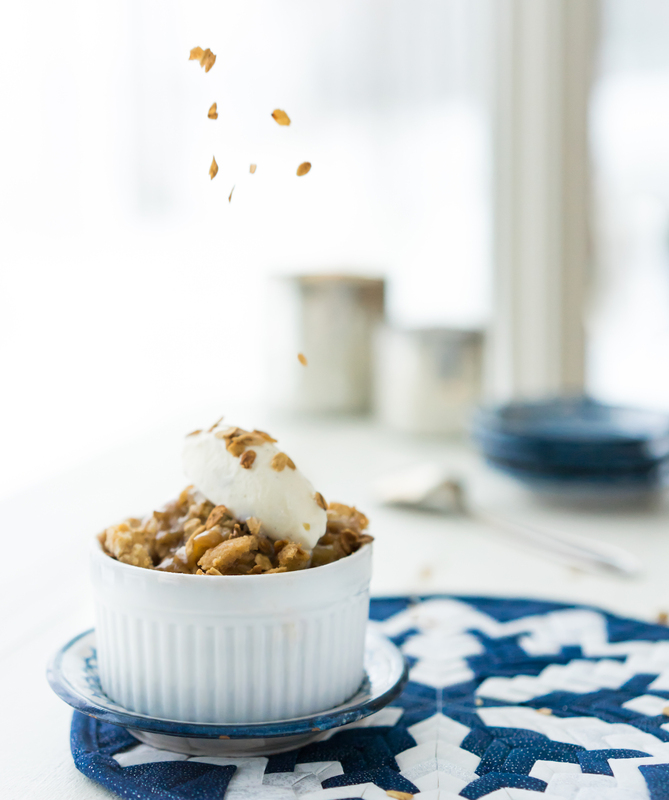 This recipe uses one of my all-time favorite Vermont ingredients – maple sugar. It’s made by stirring, and stirring (and stirring) maple syrup over a low flame until it crystalizes. It can be substituted for brown sugar in most instances, and it adds a warm and subtle maple flavor to anything you use it in. To me, it really tastes of Vermont. Want to try some in your baking or just in your coffee? I recommend my friend’s small batch, wood-fired maple products, check ‘em out here. (http://www.couchinglionsugar.com/) You can get maple sugar at most grocery and natural food stores as well. 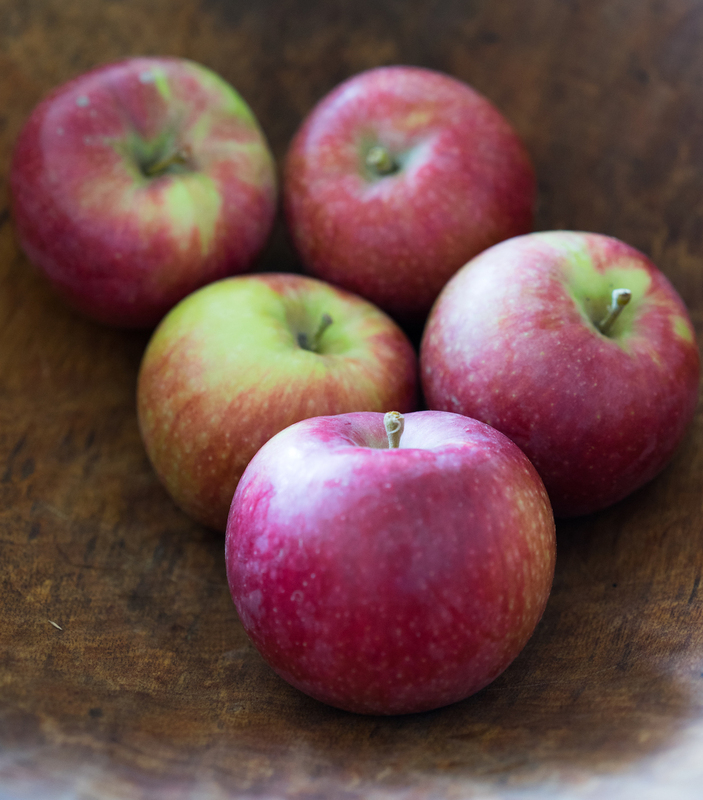 In a large bowl, toss the apple slices with the maple syrup a a tablespoon of the maple sugar. In a food processor, pulse the remaining maple sugar, flour, 1 stick butter, cinnamon, cardamom and salt until mixture forms loose clumps. Place 6 ramekins on a baking sheet. 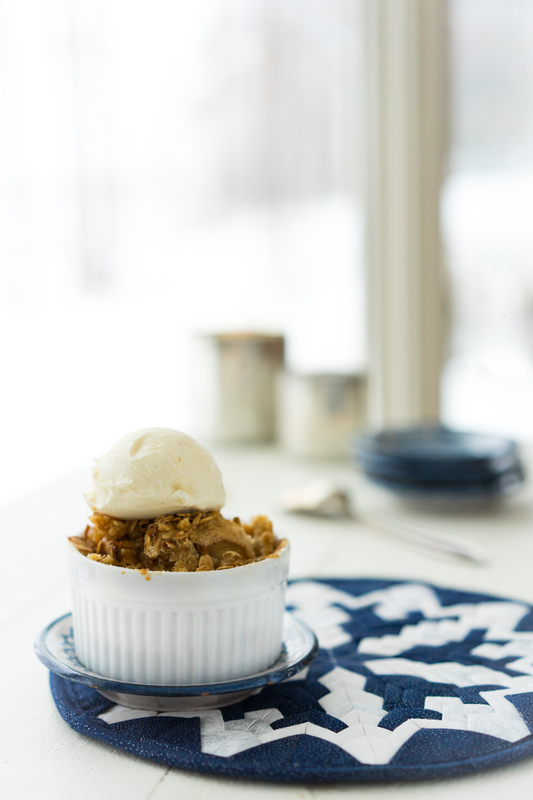 Divide the apples evenly into the ramekins, piling high as the filling will settle as they bake. 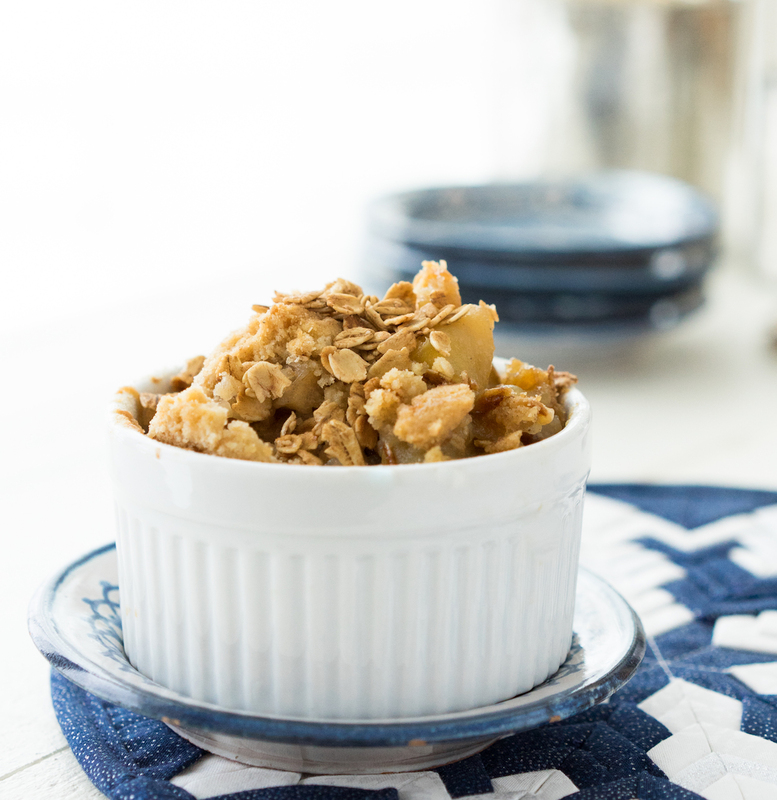 Carefully divide the crumble mixture on top of the apple crisps, carefully tapping the ramekins on the counter as you fill them so that the crumble topping distributes well and fills all the gaps. Top each crisp with a good sprinkling of granola, dot with remaining chilled butter and bake for approx 45 minutes, until apples are soft and topping is golden. Place all ingredients in a heavy bottomed saucepan. Bring to a boil over medium heat, stirring constantly. Reduce heat to medium-low and allow caramel to bubble, while stirring, about 2 minutes. Turn off heat. If caramel begins to crystallize or it gets too thick when it cools, place back on low heat and gently melt before serving.